Beach trip! We arrived at Carolina Beach mid afternoon, a long drive from Boone. A last splash at the beach before the tidal wave of students arrive at ASU. Something is different this time -- a long trench runs from the dunes to the waterline. At the high end is the staked-off sea turtle nest we had seen flagged a month before. This time there were volunteers guarding the nest, 24-7. I ambled over and asked about the situation. The volunteers of the Pleasure Island Sea Turtle Project told me that hatchlings had been emerging from the nest the last two nights and that the nest would be dug out tonight to help any stragglers. The trench the turtle people had dug was to guide the turtles toward the sea, blocking the turtles' view of manmade lights. Normally, turtles get the clue which way to go by seeing the glowing foam of the surf. Even without a moon there is enough light from natural skyglow to light up the breakers. But mankind has changed that equation with the introduction of outdoor lighting that outshines any surf. 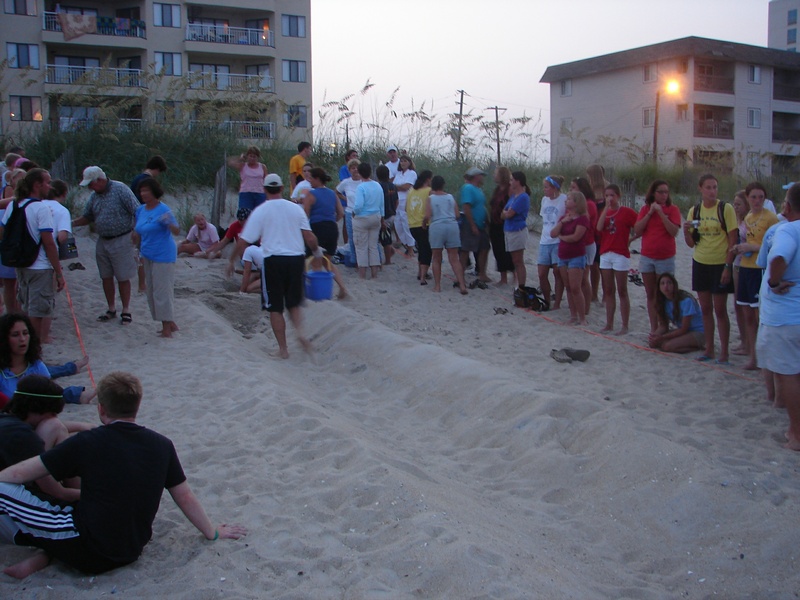 I was told that just the night before, the group manning a nest down the beach had accidentally fallen asleep. Their colleagues found them asleep at 4 in the morning. The hatchlings had escaped the trench and were heading toward a nearby streetlight. Before leaving for the beach, I had already decided to investigate some annoying lights visible down the beach, toward the Marriott, near the nest of escapees. I walked down there later that night to find the hotel was innocent. 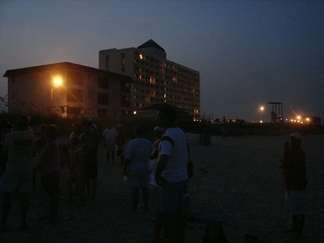 The offensive floodlights belong to the town, lighting the arcade and boardwalk area. The glaring streetlight that had lured the turtles was a good fixture but mounted at an angle, I suppose an easy way to put some light on the public access path to the beach. Changes were needed.If you think that light pollution is a threat only to the lives of turtles, think again. Over the last several years a growing body of scientific evidence has emerged that suggests that sleeping with your room illuminated, whether by nightlight or by streetlight, could be dangerous. The first hint of problems came when it was found that blind women have a lower incidence of breast cancer than sighted women. Their bodies do not know when it is daytime, so they produce melatonin around the clock. Normally we all get sleepy about 10 or 11 in the evening as nightly melatonin production starts up. It continues through the night before ramping down at dawn. It turns out that melatonin is a key antioxidant that helps the body battle the bad effects of free radicals that damage DNA, leading to cancer. And, it has been found that turning on the lights in the middle of the night will quickly interrupt the melatonin production. So, we should go to sleep in darkness and keep it dark until dawn. And, that streetlight shining in your window may be worse than just an annoyance. The volunteers at the beach dug out a couple dozen hatchlings and carried them in buckets to near the sea's edge. A worker then guided them toward the water by backing into the surf while holding a lantern. The volunteers had made amends for our lighting mistakes, bringing the equation of life back into balance. Back in Boone I emailed Bob Henderson, my contact at Progress Energy, about the situation with the lights at the beach. He responded quickly -- PE has for several years made significant contributions to protecting the night sky and had already been helping with the sea turtle project's lighting concerns. Progress Energy offers fully shielded ("full cutoff") fixture options for all of their leased lighting. They have changed full cutoff fixtures for all new roadway lighting, and have now taken that policy to Florida after they merged with Florida Power. Maybe the new management at Duke Energy will bring equally progressive lighting policies to its operation. Duke has already abandoned its old, glaring style security light in favor of full cutoff luminaires. They could do more. Bob got a Progress employee in the beach area to check out the situation, and e-mailed to say they were turning the light away from the beach. There are shields that could be placed on the floodlights leased to the town. How about your outdoor lighting? Does it light your bedroom or pollute the night sky? Does your utility offer options for protecting the night sky and guarding your health? Maybe it's time to ask them why not. Observer community columnist Daniel B. Caton is observatory director and astronomy professor at Appalachian State University. Write him at the Department of Physics and Astronomy, Appalachian State University, Boone, NC 28608, or catondb@appstate.edu.